The Review: It's been a while since Thedutchjelle released anything Duke related. But this year we also saw the comeback of Arzca, so hopefully this is the beginning of a trend. Bad Case of Mondays is, I'm happy to say, a new type of map. It revolves around exploring an expansive, even maze-like office complex that spans several floors. However, there are neither keys nor buttons, only Duke looking for a secret passageway. Vents figure prominently in this map but they don't take precedence over other means of exploration. Exploration itself is constant; there seem to be diverging paths everywhere. Often you find yourself back in an earlier area, which is in fact pretty satisfying, enabling you to scratch that path off your list and move on. There's potential here for getting lost, but the automap should be your constant companion. I can safely say that there never was a moment where I felt I had exhausted all options; even at the end of the map I was certain I had left a few paths unexplored. The map starts off with a relatively low monster count, relying mostly on slimers for a good while, but turns more and more into a traditional type of map in terms of raw combat as you make progress. The map seems to have been designed so that choosing one path over another shouldn't have too much of an effect on your ammo and health count, which is really the only right way to design a nonlinear map. The map really shines in its treatment of shadows. While the overall level of detail is moderate, the strong shadows make the map look not only very good but also reminiscent of F.E.A.R., one of the best shooters of all time. 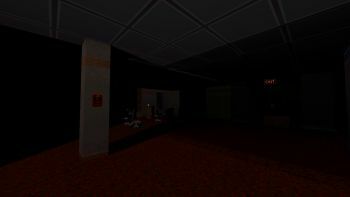 In fact, it wouldn't surprise me in the least if the author had been influenced by F.E.A.R., a horror game centered around an expansive and highly atmospheric office building. Even the low-key soundtrack reminded me of the game. That atmosphere and the constant sense of exploration and discovery are what really make the map. 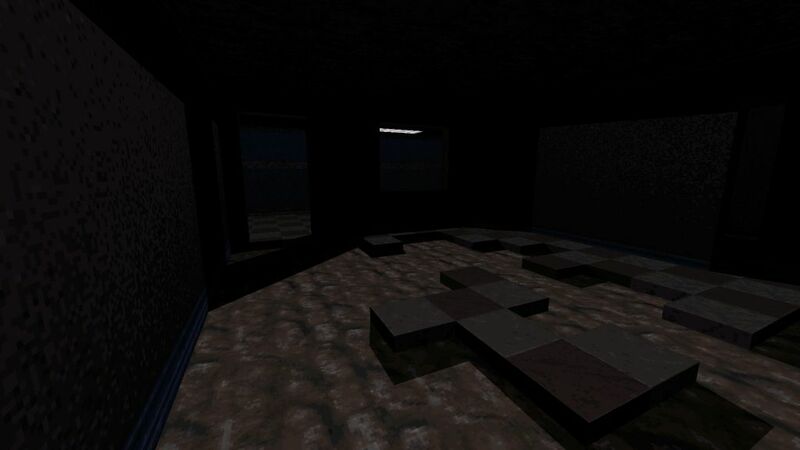 It's a spooky map strictly in its own way, which is something it achieves without any of the usual tricks such as sound effects and scripted sequences.